Plants evolve physical defences, such as spines, against browsing herbivores. However, in some cases, these defences may be anachronistic because the principal consumers of protected parts of the plant are extinct. In such cases, there may be few extant species consuming heavily defended resources. Here we examine the spiny defences of Madagascar's endemic Didiereoideae, and ask whether they may be anachronistic. To accomplish this aim, we reviewed the literature to determine which species consume these plants today, and then used stable isotope biogeochemistry to determine who may have exploited Didiereoideae in the recent past. There are four major groups of browsers that are now extinct in Madagascar: giant lemurs, elephant birds (Aepyornis and Mullerornis: Aepyornithidae), pygmy hippopotamuses (Hippopotamus) and giant tortoises (Aldabrachelys: Testudinidae). Each group was evaluated for isotopic evidence of didiereoid plant consumption. Given the structure of members of this plant clade (especially Alluaudia), we predicted that lemurs would be their most important consumers. Three extant lemur species consume Didiereoideae. Several of the extinct lemurs, particularly Hadropithecus stenognathus, may have relied heavily on these spiny plants. None of the non-lemur megafaunal browsers (elephant birds, hippopotamuses and giant tortoises) were important consumers of Didiereoideae. The 12 species of the Didiereoideae belong to four genera: Alluaudia, Alluaudiopsis, Decarya and Didierea. All members of this subfamily possess sharp, thick spines along their axes which protect their leaves5,6; however, none of the closely related Didiereaceae from mainland Africa (Calyptrotheca, Ceraria, Portulacaria) possesses spines.1 Experimental research on plant taxa in mainland Africa has demonstrated that the spines reduce foliage loss to browsing ungulates.7,8 This protection suggests that the common ancestor of the Madagascan forms was subjected to intense leaf predation shortly after its arrival. Arakaki and colleagues9 reported a diversification estimate for Madagascan Didiereoideae of 17 million years ago (mya) based on molecular data. These data imply an earlier date for the dispersal of the basal didiereoid from continental Africa to Madagascar. According to these authors, Alluaudia itself began diversifying only 11 mya. Ocampo and Columbus10 support a slightly more recent radiation of Madagascan didiereoids, with the divergence of the Madagascan lineage from the closest continental African relative at around 15 mya. Spines on these tall, emergent plants may be defences against leaf predation by climbing animals such as lemurs.6 Spines of most Alluaudia spp., for example, are found at heights above the ground (5-9 m) that were likely prohibitive for terrestrial browsers such as tortoises, hippopotamuses and elephant birds. Whereas it is conceivable that these taxa browsed juvenile forms or the lower portions of adult plants, widescale herbivory by tortoises or hippopotamuses seems unlikely. Furthermore, although the 'wiry' qualities of Alluaudia humbertii and Decarya madagascariensis may have provided some defence against elephant bird herbivory,11 their spines are relatively ineffective against birds and, presumably, other animals with hard beaks that protect their mouths, such as tortoises.12 Another reason to suspect that the spines on the Didiereoideae evolved to protect leaves against climbing animals and not against other major groups of herbivores is the timing of arrival of major herbivore groups to Madagascar. Both hippopotamuses and testudines arrived relatively recently13 - likely after the appearance of spines and diversification of Madagascan didiereoids. Only lemurs and elephant birds would have been present when the ancestral didiereoid arrived. If Bond and Silander11 are correct in characterising elephant birds as poorly suited to exploit the leaves of the Didiereoideae, then lemurs become the most plausible contenders. Additionally, if few extant lemurs exploit these plants, then the giant extinct lemurs may be implicated. Ideally, testing the hypothesis that spines served to defend the leaves of the Didiereoideae against giant lemurs requires more than compiling evidence that certain giant lemurs likely consumed these plants. We would like to know the degree to which the spines acted as a deterrent to overconsumption of small and vulnerable young leaves by giant lemurs. The latter question is challenging, at best, within the context of palaeobiology. Palaeontological evidence is often indirect, and arguments may depend on unspoken assumptions. Thus, it is important to make explicit the questions that can be addressed with the tools we have at our disposal. How, using those tools, can plant anachronisms in Madagascar be discerned? As evolutionary biologists we can ascertain, first, whether or not the Didiereoideae are native or endemic to Madagascar (i.e. not recently introduced). Secondly, we can establish whether the presumed anachronistic spines are derived. Thirdly, we can determine whether or not the hypothesised consumers (lemurs) were present when these features likely originated. We can probe whether spines can be understood outside the context of the proposed plant-animal interactions and we can examine palaeodistribution data to test the plausibility of the proposed interactions. Finally, we can explore whether spines serve any apparent purpose today, or were likely used in the past in a manner that no longer holds. To what extent do modern lemurs feed in southern and southwestern Madagascar on C3, C4 and crassulacean acid metabolism (CAM)-based plants? How much do they feed on Didiereoideae? 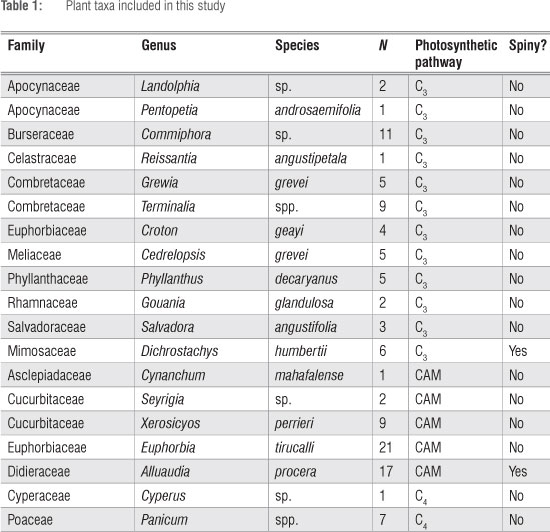 Can we distinguish Didiereoideae from other CAM plants using stable isotopes? Such discrimination is needed if we are to use stable isotope data to successfully test the hypothesis that Didiereoideae spines are anachronistic. To what extent were lemurs feeding on CAM plants in the past? Do stable isotopes suggest that any of the extinct non-lemur herbivores were major consumers of Didiereoideae? Stable isotopes can be used to reconstruct the diets of living and extinct animals. The relative proportion of heavy and light isotopes (e.g. 13C/12C or 15N/14N) in a substance is reported using a standardised 'δ' notation (e.g. δ13C, δ15Ν). These values are measured as parts per thousand (%°) higher or lower than an international standard. Isotopic patterns in plants are reflected in animal consumers with some isotopic enrichment. 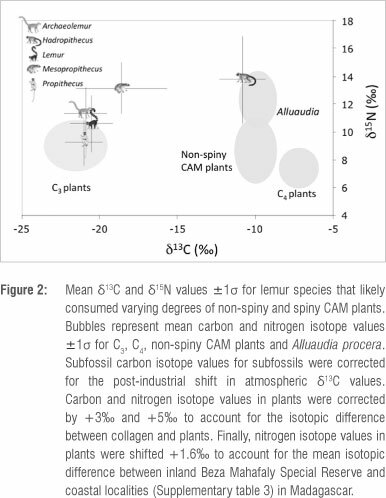 Carbon and nitrogen isotope values in herbivore bone collagen tend to be, respectively, ca. 5¾ and 3¾ higher than those in plants.21 Once we have accounted for isotopic enrichment between collagen and diet, we may be able to use carbon isotope values in consumer tissues to estimate the relative ingestion of C3, C4 and CAM plants. As with plants, nitrogen isotope values in animals can be used to distinguish habitat types.17,22 Within a particular habitat, δ15Ν values increase with increasing consumption of animal matter.21,22 However, because most of the lemur species included in our analyses are, or were, predominantly herbivorous, we do not believe our results are confounded by the effects of faunivory on nitrogen isotope values.23-32 The two possible exceptions are Archaeolemur majori (whose diet likely included some animal matter) and Daubentonia robusta. Extant D. madagascariensis consumes more animal matter than any of the other lemurs included in our study33 and it is likely that the extinct D. robusta, which lived in the southwest, would have had a similar diet.34 If this species consumed insects that in turn fed on CAM resources, elevated δ15Ν isotope values might falsely suggest CAM consumption, when in fact they really reflect trophic omnivory. We therefore omitted D. robusta from our analyses. To determine if the spiny Didiereoideae can be isotopically distinguished from other plants, we compared δ13C and δ15Ν values from leaves that we collected in the spiny forest at Beza Mahafaly Special Reserve (BMSR) in south-central Madagascar (taxa provided in Table 1). We included previously published isotope values for C3 and CAM plants17 and new isotope values for C4 plants. All plant specimens were collected between 2006 and 2009. We sampled Alluaudia procera, which is the only member of the Didiereoidea that occurs in abundance at the reserve. Alluaudia is both the most speciose and the most widespread didiereoid genus. Additionally, although carbon isotope values have been measured for a number of spiny CAM species,10,37,41 nitrogen isotope data have been published only for Alluaudia procera.17 We used an analysis of variance (ANOVA) with Tukey's tests of honestly significant differences (HSD) and Student's t-tests to test the significance of isotopic differences between C3, C4 and CAM plants, and between Alluaudia and other CAM plants. All statistical tests were performed using JMP (version 7.0). Significance was set at α = 0.05. We assessed the assumptions of normality and homoscedasticity of variance for all analyses. We tested for homogeneity of variances using Levene tests. To address the extent to which lemurs and non-primate herbivores fed on CAM plants in the past, we used δ13C and δ15Ν values from bone collagen. We analysed 72 bones of extant and extinct lemurs as well as extinct giant tortoises and pygmy hippopotamuses from subfossil sites in the Spiny Thicket and Succulent Woodland ecoregions (coastal and inland). Collagen was prepared following previously published methods.44 Samples were analysed at the Stable Isotope Laboratory at the University of California, Santa Cruz. We verified collagen preservation using collagen yield, atomic C:N ratios, and carbon and nitrogen isotope values. We added these data to our existing database of previously published isotope data.45-48 Raw isotope data for all individuals are presented in Supplementary table 3. Carbon isotope values for subfossil individuals were corrected to account for δ13C shifts in atmospheric CO2 following the industrial revolution (The Suess Effect).45 Carbon isotope values for individuals younger than 150 years BP were corrected using an age-dependent correction of -0.004% per year between 1860 and 1965 AD and -0.02% per year between 1965 and 2005 (modern). All individuals older than 150 years were corrected by -1.2%. In order to avoid sampling bias, we used nonparametric Wilcoxon signed ranks tests to compare mean δ13C values for subfossil extant and extinct lemur species. We calculated mean %CAM consumption using mixing models in ISSOERROR version 1.04.49 We used mean δ13C values for C3 and CAM plants from the spiny forest at BMSR as end members, correcting for the +5¾ difference in δ13C values between collagen and plants. We did not include C4 plants in these models because they are relatively rare in southern Madagascar and no modern lemurs are known to consume them. If δ15N values do, indeed, differentiate spiny Didiereoideae from sympatric non-spiny CAM plants, then we may be able to use mean δ15N values in addition to δ13C values to distinguish consumption of Didiereoideae. We corrected plant values by +3% to account for the difference in δ15N values between collagen and plants.21 We also corrected for the small 1.6%° difference in δ15Ν between coastal and inland animals (Supplementary table 4). What do modern lemurs eat in southwestern Madagascar? Loudon et al.50 and Gould et al.32 estimate 15% CAM consumption for L. catta living in spiny forest at Tsimanampetsotsa and Berenty Reserve, respectively. Consumption of CAM resources by L. catta at Cap Sainte Marie can be >75% during some months.28 Although the vast majority of the CAM plants consumed by members of the latter population are introduced, including Opuntia (prickly pears), native CAM species such as Aloe and Kalanchoe can each comprise >10% of the diet of L. catta during some months of the year. On the other hand, Lepilemur living in the gallery forest at BMSR does not consume any Didiereoideae but relies to some degree on non-spiny Euphorbia tirucalli.51 These differences underscore the potential site specificity of variation in feeding observations. Do Alluaudia differ isotopically from sympatric CAM plants? Carbon isotope values differ significantly for CAM, C3 and C4 plants from BMSR (Figure 1; F2,111=714.9, p<0.0001). Post-hoc HSD tests indicate that all three are distinct. Carbon isotopes cannot distinguish Alluaudia procera from sympatric CAM plants (p>0.05). However, nitrogen isotope values do clearly separate these two plant groups (t=5.38, df=40, p<0.0001). Alluaudia has distinctly elevated δ15N values (Figure 1). We found no differences in mean δ13C values between subfossil extant and extinct lemur species (Wilcoxon signed ranks, S =17, z =0, p=1.0), although our subfossil sample showed greater variance. Mixing models based on δ13C values suggest that subfossil individuals belonging to each of the three extant species consumed mostly C3 resources (Table 3). CAM consumption was negligible for subfossil Lepilemur, but modest CAM consumption is indicated for subfossil Lemur catta (8.5%) and Propithecus verreauxi (5%). These values are slightly higher than CAM consumption estimates for P. verreauxi and L. catta living today in gallery forest,27 but they are not as high as values for L. catta in dry forest at coastal localities in the south.28,32,50 Importantly, substantial CAM consumption by modern lemurs, even at coastal localities, is a seasonal phenomenon.28 Because isotope values in bone collagen integrate several years of dietary input,21 modest %CAM estimates for subfossil individuals may reflect seasonal fluxes in CAM consumption. Among the extinct taxa living in the south and southwest, Megaladapis edwardsi, M. madagascariensis, Pachylemur insignis and Palaeopropithecus ingens show no evidence of CAM consumption (Table 3; Supplementary table 3). In contrast, our data indicate modest CAM consumption by Archaeolemur majori (5%) and significant CAM consumption by Mesopropithecus globiceps (25%) and Hadropithecus stenognathus (92%). In summary, while it is evident that not all southern lemurs consume CAM plants today, and it is unlikely that all consumed them in the past, some CAM consumption can be documented in a wide variety of lemur species. Because isotope values in plants are reflected in their animal consumers, we may be able to use differences in δ15N between Alluaudia and sympatric CAM plants to identify lemurs that consumed Didiereoideae in the past. Among those species identified as CAM consumers by their δ13C values, differing δ15N values suggest varying degrees of Alluaudia consumption (Figure 2). Nitrogen isotope values indicate that Didiereoideae were not a dominant element of L. catta or P. verreauxi diets. Among the extinct taxa, A. majori may have consumed small amounts of Didiereoideae. However, M. globiceps may have consumed substantial amounts of Didiereoideae, and H. stenognathus, which is characterised by exceptionally high δ13C and δ15N values, may have relied heavily on Didiereoideae (Figure 2). The living lemur most reliant on Didiereoideae is likely Lemur catta. This species may have consumed more Didiereoideae in the past than it currently does in moist gallery forests.23,45 Goodman and colleagues55 noted the distributional overlap of L. catta and the Didiereoideae. They suggested that this lemur species may have evolved in dry forests and subsequently moved into moister riparian forest, where didiereoid taxa do not exist. In fact, even today, in some arid habitats where L. catta still thrives and CAM resources abound (e.g. Tsimanampetsotsa, Cap Sainte Marie), these lemurs consume substantial amounts of Didiereoideae and other CAM plants.28,50 More research is needed to document the degree to which L. catta exploits Didiereoideae as opposed to other CAM plants. The fact that both Alluaudia and Hadropithecus have extreme δ13C and δ15Ν values is striking. The geographic overlap of the Didiereoideae and Hadropithecus stenognathus is also remarkable (Figure 3). With the exception of Ampasambazimba in Central Madagascar, all subfossil localities yielding Hadropithecus fall within the modern distributional range of the Didiereoideae. Compellingly, δ13C values for the two H. stenognathus individuals sampled from Ampasambazimba suggest a pure C3-based, rather than a CAM-based, diet (δ13C <-22%o). This geographic overlap combined with the match for both δ13C and δ15Ν between Alluaudia and Hadropithecus, strongly suggests that Didiereoideae was a staple in the diet of Hadropithecus in the Spiny Thicket and Succulent Woodland ecoregions of Madagascar. Our subfossil isotope data do not support the notion that Lepilemur consumed large quantities of Alluaudia in the past. This finding might be considered curious, because Lepilemur is the only living lemur that has been reported to consume large quantities of Alluaudia today. The diet of Lepilemur has been studied in detail only at two localities in southern and southwestern Madagascar: the spiny forest at Berenty Private Reserve where Alluaudia exists, and the gallery forest at BMSR, where didiereoid taxa do not exist. Alluaudia spp. may comprise close to 100% of this species' diet at Berenty Private Reserve at least during the dry season.2,24,25 Yet δ13C values for Lepilemur from multiple subfossil sites in the southwest indicate negligible CAM consumption in the past (Table 3; Supplementary table 3). Because our subfossil Lepilemur specimens come from several, geographically widespread, localities (two inland, one coastal), it is unlikely that this result reflects sampling bias. Instead it would appear that modern individuals might have recently shifted their diet at Berenty to include a resource that was inconsistently exploited (if at all) in the past. 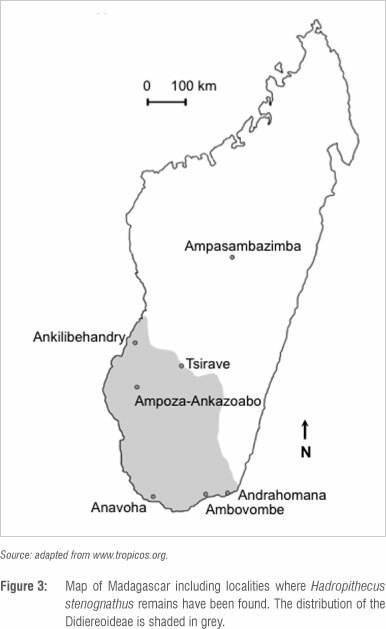 Recent transitions in diet or habitat may be widespread among modern lemurs living in southwestern Madagascar.45 Isotope values for subfossil Lepilemur do not differ significantly from those for extinct Archaeolemur majori, Megaladapis edwardsi, M. madagascariensis, Palaeopropithecus ingens or Pachylemur insignis. Four of these (all except Archaeolemur) have a 0% CAM signal, as does subfossil Lepilemur. Of these four, the two Megaladapis species have dental topography much like Lepilemur,23 as well as relatively small infraorbital foramina29 and dental microwear30,56 that suggest dominant foliage consumption. Did now extinct non-lemur herbivores consume Didiereoideae? Estimated CAM consumption for extinct hippopotamuses, tortoises and elephant birds is minor compared to that for Mesopropithecus and Hadropithecus. Mixing models suggest that, on average, Hippopotamus spp. and the giant tortoise Aldabrachelys spp. consumed only 3% and 8% CAM, respectively (Table 3). Clarke et al.57 used δ13C values in Aepyornis eggshells to estimate that elephant birds consumed ca. 11% CAM. Nitrogen isotope values are similar in subfossil Hippopotamus, Aldabrachelys, Lemur catta and Propithecus verreauxi (Table 3; Supplementary table 3), indicating nominal consumption of Didiereoidea for these species. Nitrogen isotope values do not exist for Aepyornis. However, their δ13C values suggest that elephant birds did not exploit large amounts of Didiereoideae. Stable isotope data do not support significant CAM consumption by non-climbing extinct herbivores such as elephant birds, giant tortoises or pygmy hippopotamuses, but they do support significant CAM consumption in several extinct lemur lineages. It seems likely that spines evolved in the ancestral didiereoid as a defence against lemur folivory. At the very least, as didiereoids diversified to include relatively large spiny trees in southern and western Madagascar, they must have been exploited by climbing herbivores of some kind. Because so many herbivores in the south and southwest have become extinct, one might hypothesise that the spines on these plants are today anachronistic. The unusual isotopic signal of these plants allows us to test the plausibility of this hypothesis, and to offer new insights into likely past consumers. Our data support the conclusions that the herbivores exploiting the leaves of Alluaudia were largely climbing lemurs, and that the loss of giant climbing lemurs has rendered the spines of didiereoid plants, such as Alluaudia, increasingly anachronistic. With the exceptions of Lepilemur and Lemur catta in some locations, lemur species today consume little CAM. 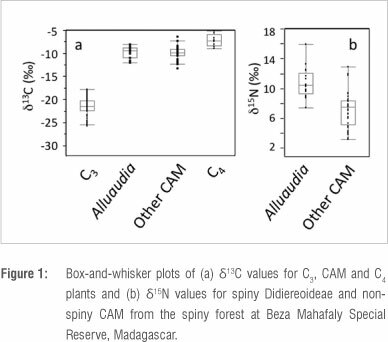 However, carbon isotope values indicate that both extant and now-extinct lemurs may have consumed more CAM plants in the past, including didiereoid taxa such as Alluaudia. In particular, Lemur catta, Mesopropithecus globiceps, and especially Hadropithecus stenognathus, may have relied heavily on Didiereoideae in the recent past. If indeed the dominant consumers of Alluaudia leaves are now extinct, these plants may no longer require formidable defence. We thank Dyke Andreasen, Lalao Andriamahefarivo, Anne Axel, Zachary Rogers, Wendy Applequist, the Madagascar Institut pour la Conservation des Ecosystêmes Tropicaux, the Missouri Botanical Garden and the BMSR staff for technical and logistical assistance; the Université d'Antananarivo Ecole Supériure des Sciences Agronomiques Département des Eaux et Forêts for permission to collect plants at BMSR; Margaret Schoeninger and Leanne Nash for providing Lepilemur isotope data from BMSR; and Stephen Nash/Conservation International for permission to reproduce illustrations of lemurs. Subfossils were sampled under collaborative agreements between LRG, D.A. Burney, W.L. Jungers and the Département de Paléontologie et d'Anthropologie Biologique, Université d'Antananarivo. Funding was provided by a Guggenheim fellowship to L.R.G. and the UC Lab Fee Research Program (09-LR-07-115818-DOMIN to BEC). Both authors participated in the planning and design of the research. L.R.G. conceived of the project and B.E.C. conducted analyses. Both authors wrote the manuscript.